If you’re like me, a sandwich can never be too cheesy. This one is delish dunked in ketchup, sriracha, sriracha-infused ketchup, or, better yet, Roasted Tomato Soup. Preheat a non-stick skillet over medium heat. Set out the four slices of bread and butter one side of each. Place two slices of bread butter side down onto your preheated grill or pan and top with cheese the cheeses, reserving about ¼ cup of the grated cheese for later. Top each with a second slice of bread, butter side up, and cook until the bottom is golden brown and the cheese is starting to melt, about 4 minutes. Flip and cook the other side until golden and the cheese is fully melted. Remove the sandwiches and scatter the remaining cheese over the bottom of the pan. Allow the cheese to melt and start to get nice and bubbly. Pop the sandwiches on top of the melting cheese and allow it to cook for another minute or so or until the cheese is crispy and lovely. Remove the sandwiches to a cutting board, crispy cheese side up and allow them to cool slightly. 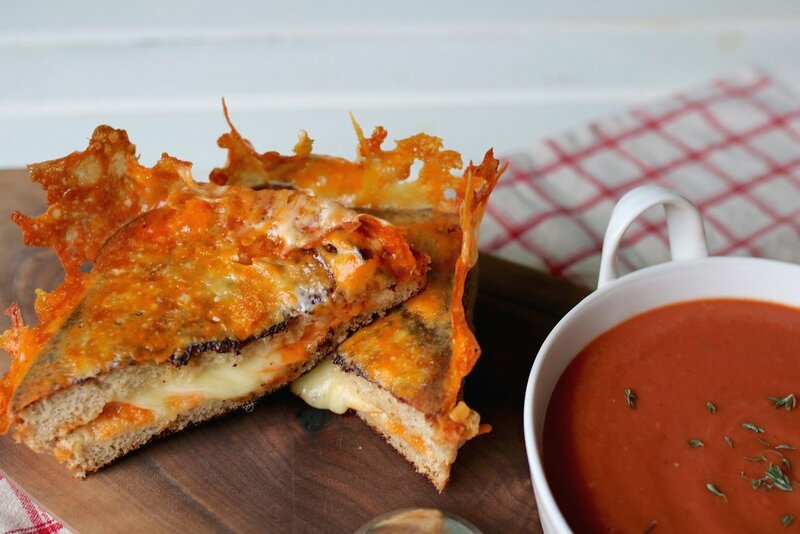 Cut each sandwich in half and serve straight away for optimal gooeyness and crispiness! *If you don’t have butter at room temp, try using mayonnaise for your grilled cheese. It’s kind of my new favourite thing - it’s so easy to spread and browns up so beautifully! Challah at me! ... do people still say that? Challah: what isn't it good for? Slathered with butter and jam for breakfast? OK! Fresh out of the oven? Duh! Sure, you could pick up a loaf at the store but making this beautifully braided bread at home is so easy! The perfect eggy bread for your Easter feast or really any occasion that could use a slightly sweet, super simple, perfectly plaited loaf! In the bowl of your stand mixer, whisk together the warm water, yeast, and sugar and allow the yeast to bloom and bubble up for around 10 minutes. When the yeast is all lovely and foamy, beat in the honey, vegetable oil, and eggs. Holding the hook attachment for your stand mixer in your hand, beat in one cup of flour at a time until it gets too difficult to mix by hand. Add in the salt. Attach the hook to the mixer and knead the dough until it is smooth, elastic, and no longer sticky, adding more flour as needed. Cover the bowl with a small piece of plastic wrap and a clean kitchen towel and allow the dough to rise in a warm place for 1–1 ½ hours or until doubled in bulk. When the dough has risen, punch it down and turn it out onto a lightly floured surface. Divide the dough in half and give each a few kneads. Set the balls of dough aside for about 5 minutes to relax the gluten then divide each ball into three equal pieces. Roll each into a long snake about 1 ½ inches in diameter. Pinch the ends of three snakes together and braid them into one loaf. Do the same to the other three pieces of dough and lightly grease two baking sheets. Place the braided loaves onto the baking sheets and lightly cover each with plastic wrap and a clean kitchen towel and allow them to rise again in a warm spot for about one hour. Preheat the oven to 375F and beat the egg yolks with 2 tablespoons of water in a small bowl. Using a pastry brush, lightly brush the loaves with the egg wash and sprinkle each with sesame seeds and/or poppy seeds. Pop the loaves into the oven for 20–30 minutes or until a deep golden brown then loosely tent the loaves with aluminum foil. Continue baking the loaves for 10–15 minutes or until the internal temperature of the bread registers 190F. Remove the loaves from the oven and transfer them to a wire rack to cool. Store the loaves well wrapped at room temperature for up to 3 days or freeze for up to 1 month. This bread is literally the easiest bread out there. No snazzy yeast, no finicky sourdough starter, just some baking soda, baking powder, and buttermilk to get this dense and delicious loaf ready for your plate! Preheat your oven to 425F and line a large baking sheet with parchment paper. In a large bowl, whisk together the all-purpose flour, whole-wheat or spelt flour, salt, baking soda, and baking powder. Make a well in the centre of the dry ingredients and pour in 1 ¾ cups of the buttermilk followed by the melted butter and honey. Using a wooden spoon, stir until all of the liquid has been evenly mixed in. If needed, feel free to add some of the remaining buttermilk to make the dough come together. Once the dough is too stiff to stir with the spoon, lightly flour a work surface and turn the dough out onto it. Gently knead the dough to form it into a rough loaf but be careful not to overwork it. Transfer the dough to the parchment lined baking sheet and, using a large knife, score an ‘X’ across the top making sure to cut about halfway down. Use a pastry brush to paint a thin layer of buttermilk all over the top of the loaf and scatter the top with pumpkin seeds. Bake the bread in your preheated oven for 25 minutes then reduce the heat on your oven to 350F and continue to bake for an additional 20–25 minutes or until the loaf sounds hollow when you rap on the top with your knuckles. Transfer your loaf to a wire rack and allow it to cool.